Let’s Talk (Speckled) Turkey (Chili)! I’m sitting in my kitchen right now, at the bar, and am completely content. Two of my sons are playing a game together. The other one is taking an afternoon nap, as are the dog, Abby, and cat, Moose. I have chicken boiling on the stove in a big, shiny pot full of onions and celery seed and sea salt, making delicious broth for chicken enchiladas, chicken fettuccine casserole, and speckled turkey chili. This day has been so lovely! When I woke up this morning, the temperature outside was 60 degrees. I couldn’t have been happier. I slipped away to the grocery stores, and came home with a car full of bags for the boys to unload. They were beyond ready for me to restock this kitchen! I guess I waited a little too long to shop. Now the sun is slowly going down, and the sunlight is filtering into my kitchen through the leaves on the red oak trees behind my house. The scent of the broth with the onion and celery seed reminds me of Thanksgiving. I am so ready for autumn! I love this time of year! 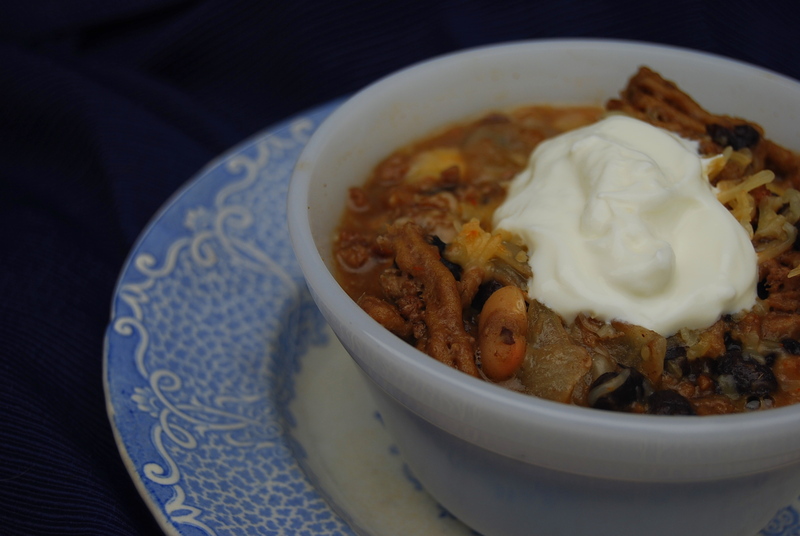 One of my easiest recipes for a filling meal in cool weather is speckled white turkey chili. I like to make a big batch so I’ll have leftovers in the fridge to reheat for quick lunches later. It’s also relatively healthy, too, so you don’t feel guilty indulging in it. 🙂 I hope you enjoy it as much as my sons and I do! After the meat has browned and onions are translucent, add the cumin, tomato paste, salt, and pepper. Stir in, and cook for a minute. Stir in the chicken broth and water, and simmer for about thirty minutes, stirring occasionally. Don’t let broth boil away. Add more if it looks too dry for your taste. Serve in a bowl with a sprinkling of grated cheddar cheese and a tsp of light sour cream. Delicious!